The body that was responsible for the management of Grenfell Tower has had its contract to maintain social housing in Kensington and Chelsea terminated. Councillors on Kensington and Chelsea Council unanimously voted to end the contract with Kensington & Chelsea Tenant Management Organisation. Members said the TMO "no longer has the trust of residents in the borough". Council leader Elizabeth Campbell said 20 families affected by the fire are now in permanent accommodation. She said a further 52 households had accepted an offer in principle. The TMO, which was established in 1996 to manage almost 10,000 properties in the borough, has been heavily criticised by residents following the fire, on 14 June. In August, it was stripped of its responsibility for the management of properties in the Lancaster West housing estate, including Grenfell Tower. However, the council said it would now work with the TMO to bring its whole contract to an end. Deputy council leader, Kim Taylor-Smith, said the contract would be ended "in an organised fashion", adding: "We are listening to residents and consulting on how they want their homes and neighbourhoods to be managed in the future." He cited a lack of confidence in the organisation's fire safety record and a unanimous vote of no confidence from 25 residents' associations. Council leader Elizabeth Campbell said the council had bought 120 homes, while a further 20 purchases were in the hands of solicitors and 20 more under negotiation. She told the meeting it was "not a time for haste, this is a time for getting it right" following criticism the authority had been too slow to rehouse survivors of the disaster. "I am confident the number of people moving in to new homes will increase dramatically in the coming months," she said. However, there were cries of "shame" from members of the public while another person shouted: "You move in to a tower block then." Labour councillor Robert Atkinson condemned the slow rate of progress at rehousing survivors, saying: "The council needs to be doing more and needs to be doing it faster." He called on the government to recommit to promise an amnesty for any illegal migrants affected by the fire. He said it was the only way for any inquiry to get to the truth. It comes after police this month said the number of people who died in the fire may be a little lower than the previous estimate of 80. They say the figure "may come down a little bit" because of some potential cases of fraud. 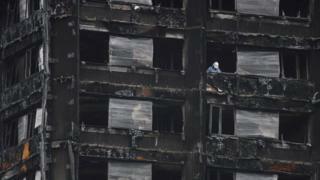 Scotland Yard also said it may consider individual as well as corporate manslaughter charges.